Looking for a hearty finger food for a party or a small plate supper? 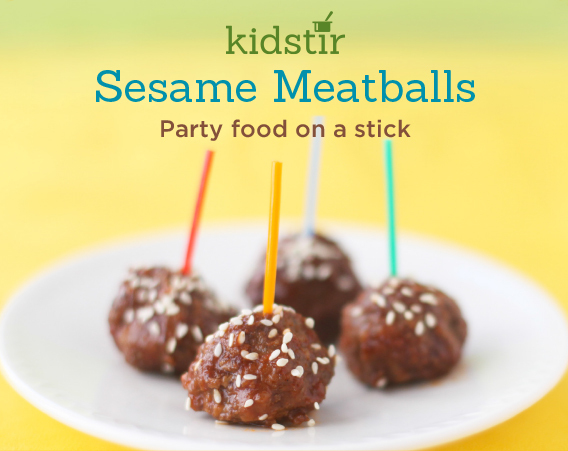 Serve up a platter of these mini meatballs. Bake them first in the oven, then simmer in a honey garlic soy sauce on the stove or in a crockpot. We used ground beef and pork, but you can substitute ground lamb or turkey to suit your family's taste. 1. In a large bowl, mix the ground meats, egg, garlic, bread crumbs, and salt. Make 1 to 2 inch meatballs and place them on a baking sheet. Wash your hands well! 2. A grown-up can help broil the meatballs on high for 10 minutes, turning them with tongs halfway. 3. Mix together the soy sauce, ketchup, honey, and garlic in a saucepan or crockpot. Place the meatballs in the pan or crockpot. Simmer the meatballs for about 30 minutes over the stovetop, or cook on low for 2 hours in the crockpot. If the sauce gets too thick, add a little water or broth. 4. Serve up the meatballs on a plate. Sprinkle with sesame seeds. Eat with toothpicks or party picks.